ENTER AN ADDRESS OR ZIP CODE TO DISPLAY DIRECTIONS. Please note that an 18-month project to reconstruct a 1.5 mile section of North Santa Monica Boulevard from Wilshire Boulevard to Doheny Drive will begin on Wednesday, January 11. The project will begin at Wilshire Boulevard to Rodeo for the first five months. We strongly encourage you to allow extra travel time to all performances at The Wallis during this 18 month period due to lane closures and heightened traffic. Please be aware that Crescent Drive and access to the parking garage on Crescent Drive will be closed from Wednesday, February 13 – Thursday, February 28 due to the Vanity Fair Oscar Party. The garage is still accessible via South Santa Monica Boulevard during this time and normal valet parking services are still available by entering the Arrival Court from Canon Drive. 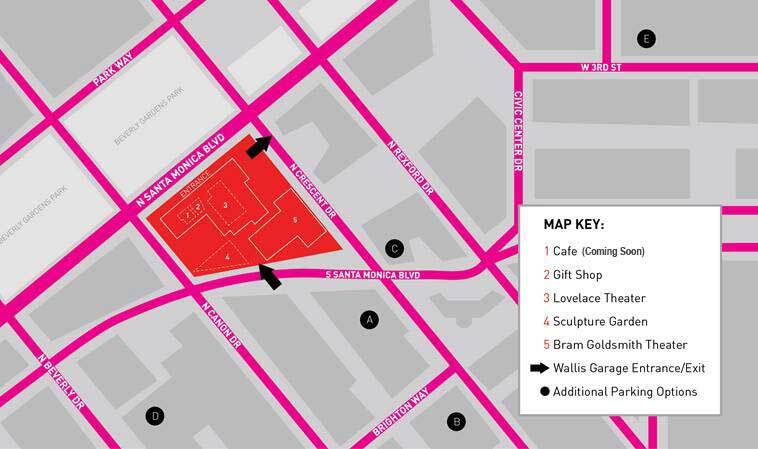 Please allow extra time for your arrival to The Wallis due to this street closure. We apologize for any inconvenience. For more information on the construction project please visit the City of Beverly Hills’ web site HERE. Valet and Self-Parking are available at The Wallis. Valet parking can be accessed by entering the Arrival Court from Canon Drive, dropping you off in front of the Historic Post Office. Self-parking is available in our underground garage (450 N. Crescent Drive) with entrances from Crescent Drive and South Santa Monica Boulevard (see map below). $16.00 for Evening Performances and $13.00 for Matinee Performances. Valet will be in service until 10:30pm. $8.00 for Evening Performances - Flat Rate begins at 6:00pm. The Wallis staff members are available to assist you every step of the way from the moment you arrive to helping you find your seats. A Patron Services desk is located in the main lobby; the helpful staff will gladly assist you with any needs. Please note that Valet services and the 450 N. Crescent Drive parking garage are operated by the City of Beverly Hills and not the Wallis Annenberg Center for the Performing Arts. Please Note: Valet parking will remain open for one hour following any performance to retrieve your vehicle. After one hour, Valet will secure all remaining vehicle keys for the evening and vehicles may be retrieved when the parking office opens the next business day. Parking is available at the garage at 450 N. Crescent Drive. Parking Fees apply. *Regular self-parking rates are in effect for any vehicles entering the parking garage before 6:00pm for evening performances and before 1:00pm for matinee performances.